Rudder 4.3 has been released on April 19th 2018 and brings a lot of much anticipated usability improvements. Multi version/mode Directives: You can now apply Directives with different versions and different policy mode on the same node. This allow easy migration (to a new version, from Audit to Enforce) that was previously impossible. Authorization system for API accounts: Choose between read-only or full access. A plugin will be available soon in order to allow you more finely grained authorization. Node properties from inventory: Node properties can be automatically provided by the inventory data from the node. Node lifecycle: You can define a state for each Node managed by Rudder (provisioning, pending removal, disabled etc.). This can be used to build groups and apply configuration according to the Node current state. Also disabled Nodes are not counted in compliance reports, so you are not bothered by offline Nodes when checking compliance. Group based on Groups: You can now define that a Group should contain the Nodes of another Group, making it easier to manage a complex set of Nodes. Graphs on the dashboard are now clickable: You can access the list of nodes in a category by clicking on parts of the graphs. Import/Export of techniques in the Technique Editor: There is now a button to export or import a technique in the Technique Editor, allowing sharing techniques easily. Be careful, this import/export only works between servers running the same Rudder version. IPv6 support by default: Rudder is now completely compatible with IPv6 on the agent side as well as server side. Hooks on Techniques: When you write a Technique by hand, you can add pre- and post- hooks in it that will be executed once per Technique, even if you applied it in several directives. Use system Perl: On recent systems, rudder-agent does not embed Perl anymore, so it uses an up to date version of Perl more integrated to your system. All the needed dependencies are either declared (for the common ones) or still embedded. On a side note, it makes it easier to build a rudder-agent package (which size goes down from 12MB to 4MB!). 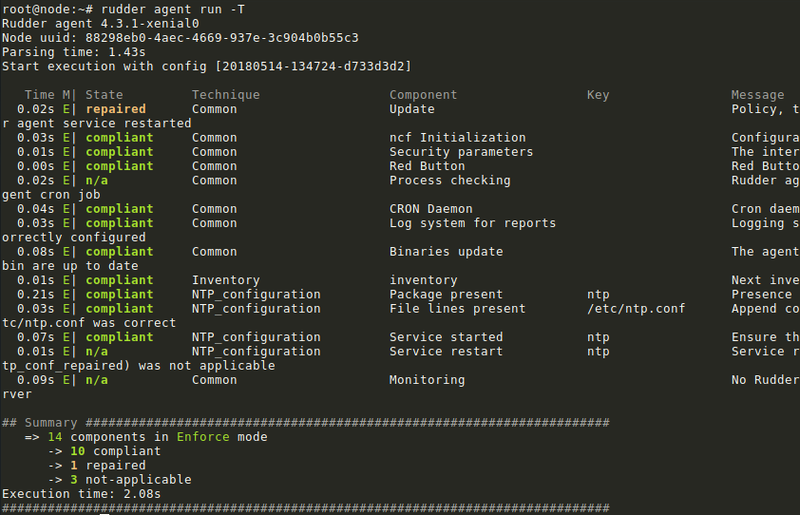 Rudder agent services based on systemd: On systemd based os, we switched from SysV init system to systemd, to make rudder-agent more integrated to your system. Time all actions made by the agent: A new option (-T) added to “rudder agent” command line, to display how long an action took and find what makes a run slow. Renaming of all generic methods: We changed for a clearer and more logic name scheme in all our generic methods in the Technique editor. Simplified logger for Techniques: We changed the way we do reporting for Techniques from Technique editor with a much simpler way, which should be faster and also fix some reporting issues (ie: when you use variables in your reports). Plenty of library updates / cleaning / architecture changes: Either on web app or in rudder-agent we upgraded some dependencies, refactored some code, to provide you a more secure, maintainable and faster Rudder. 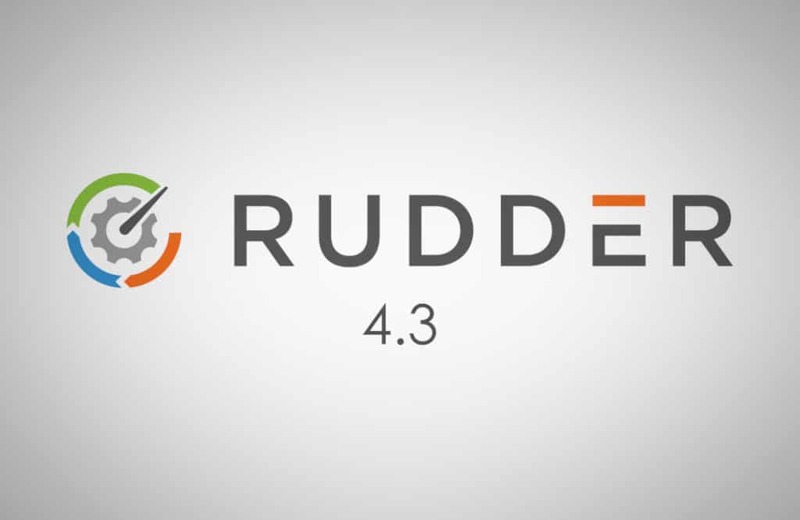 Rudder 4.3 is available now! Vagrant: Just want to test Rudder without worrying about a full installation, but with real virtual machines so that you can actually configure and test things, unlike the demo? We provide a Vagrant set-up. See Rudder Vagrant for getting started with Rudder on Vagrant. Linux server packages: The easiest way to test and use Rudder for prototyping or production is to install it from the provided Linux packages. For the server, the main current .rpm-based (RedHat, CentOS, SLES) and .deb-based (Debian, Ubuntu) distributions are supported. See https://www.rudder-project.org/site/get-rudder/downloads/ for details about repository and available versions. Come and discuss and ask any questions you may have directly to the development team and the Rudder community via email, IRC or Twitter. RUDDER 4.3 brings the last consolidations on the features that version 4.0 brought. Feedbacks received allowed us to enrich and perfect them over 3 versions while working on the big novelties to appear soon in RUDDER 5. En raison de la nouvelle réglementation sur les données personnelles, nous vous invitons à vous abonner à notre newsletter francophone. Si vous vous êtes déjà inscrit depuis longtemps, remplissez et soumettez à nouveau le formulaire pour confirmer que vous souhaitez être tenu(e) informé(e) des nouvelles de RUDDER. Si vous ne le faites pas, il y a une chance que vous soyez retiré(e) de notre base de données en raison de la nouvelle loi sur la période de conservation des données.